This week, my project didn’t turn out exactly like I was originally planning, so I’m going to be writing two different tutorials in this post. The first portion of the tutorial will be how to make the fold down workbench that I ended up with and the second tutorial will be how to make the fold down workbench that I started building. However don’t forget that I already have a tutorial out showing how to build a workbench that folds up so be sure to check that out. Here is the video below showing my entire build process. Ok, to start off, Rockler supplied me with the T-Track Table Top. If you are interested in purchasing one, you can find them HERE! 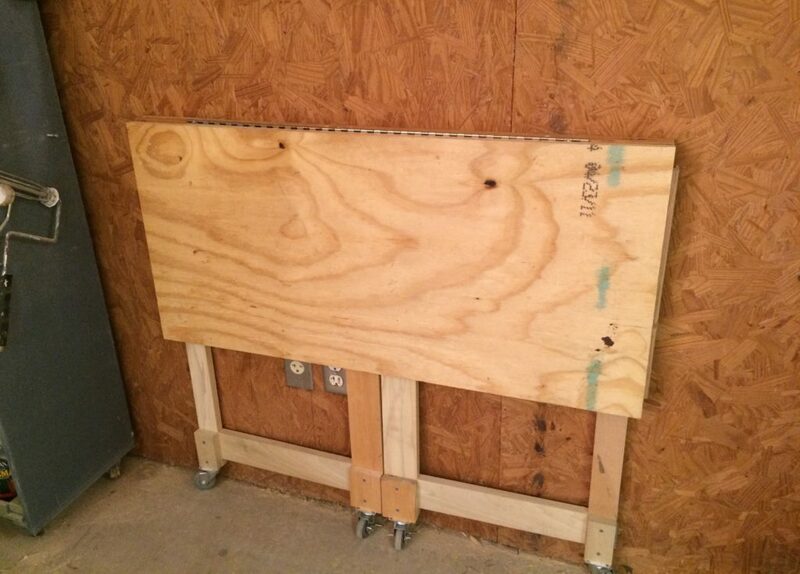 Take the table top to the board mounted on the wall and attach the other portion of the hinge to this board. Tip: I used a scrap board to act as a sort of kickstand to make this step easier. 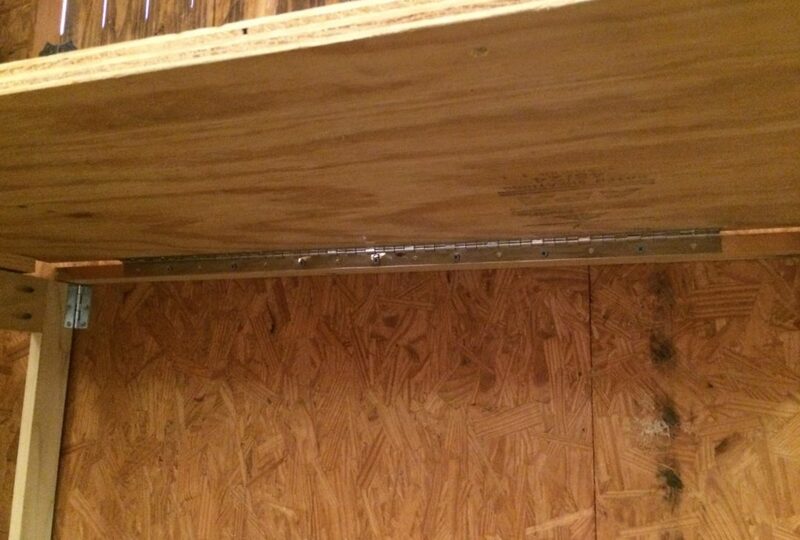 Also, I used 1 1/4″ screws here instead of the screws that came with the hinge. And that’s it. Very simple. To fold it up you move the small leavers on the folding leg brackets and fold them up then you can lower the entire bench. This will reduce a 30″ workbench into a 4 1/2″ in just a few seconds. Alright, I ended up making a second bench because I went through the effort of building all these parts but then decided to go a different direction. So instead of tossing them, I just built a second workbench. For this one I used a scrap piece of 3/4″ construction grade plywood for the top, and I made it 20″ x 40″. 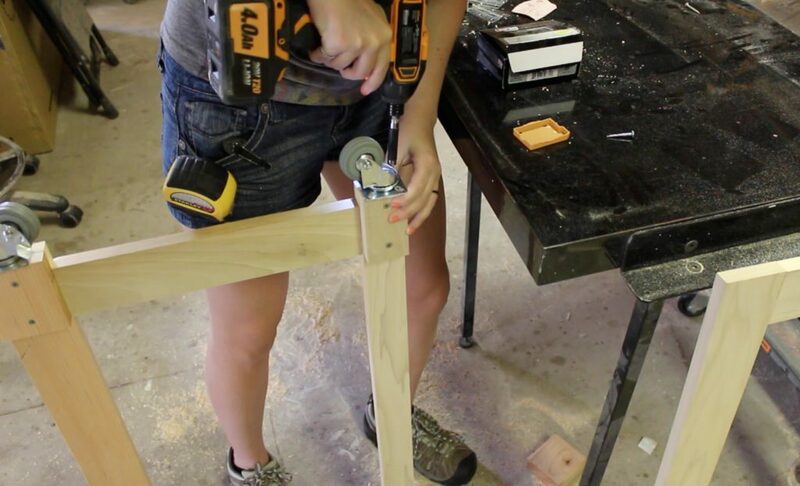 I grabbed some 1x scrap boards and first cut to length the pieces to make up the legs. I used my miter saw to first cut them to length and then my table saw to rip them to the width I needed. I drilled pocket holes in the cross braces and then used glue and screws to attach everything. My legs are 32″ high and 19″ deep. I purchased some hinges and attached one to the very top so that it was flush with the top then one near the bottom, using the screws that came with the hinges. Since my walls and floor are not exactly square to one another the assembly didn’t want to extend all the way out without me having to force it. I fixed that problem by adding casters to the bottom. But in order to add casters, I needed to thicken up the material on the bottom so I grabbed some of the cut-offs and first pre-drilled and then attached them with screws. Now I was able to flip it up-side-down and attached 2″ casters to both of the legs. 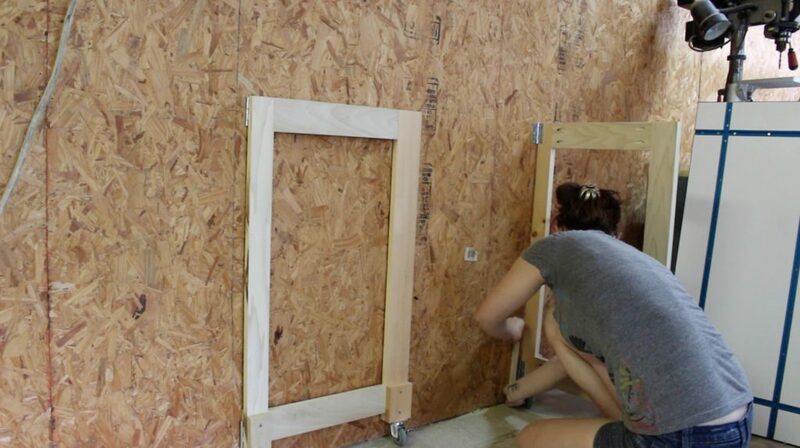 Next I took these leg assemblies over to the wall and attached them to the wall using the hinges. To fix the problem of my walls not being square to my floor, I used some scraps to shim up the area behind the hinge so that they would be square to the floor. With both of the leg assemblies attached to the wall, I next grabbed the piano hinge and cut it to 40″ (length of the table). To do this, I used some cutting fluid and my reciprocating saw. 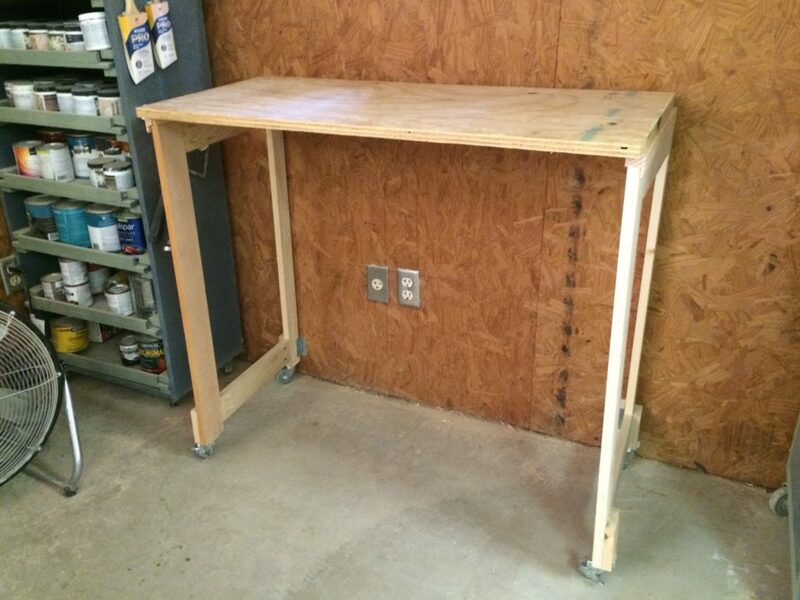 Next, I flipped the workbench top (the plywood) up-side-down and mounted the hinge to the very back. Note: With this top being much lighter I did use the screws that came with the hinge. Now I couldn’t attach the hinge directly to the wall because I need it mounted out away from the wall slightly so it will fold over the leg assemblies. 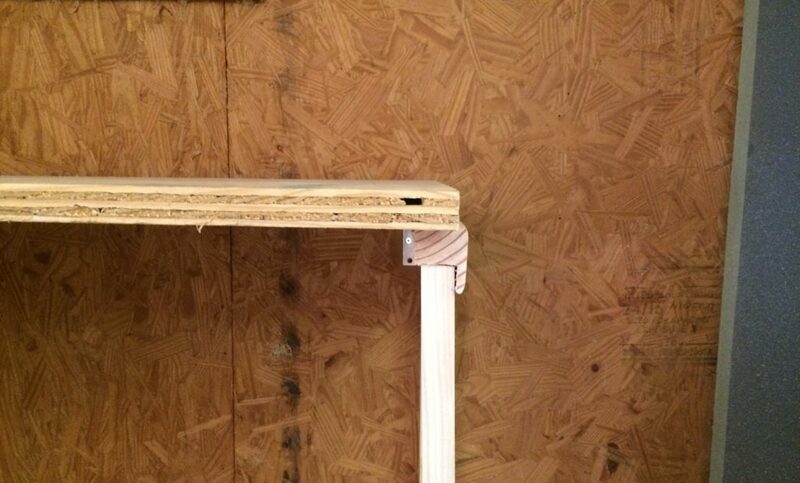 So I grabbed a 2″ x 4″ and used my table saw to cut it down to 1 1/2″ x 40″. Then I located the studs in my wall and attached it, using 4″ screws. Note: The reason this is so thin is because the taller you make this board, the more of a gap there will be between the table top and the legs. At this point, the two leg assemblies should be able to open and close with no problem. I grabbed the plywood top and set it on top of the leg assemblies while I crawled underneath and attached the hinge to the wall mounted board. Alright, now the table top is mounted but there is a gap in-between the table top and the leg assembly. To remedy this, I created some spacers that had a channel cut in them. I left a 1/4″ lip to make a stop for the legs, but then cut out the rest using my table saw. I made this channel 1″ wide and 3/4″ deep. This makes it where I can set it on top of the leg assembly and the table top will now sit level annnd the 1/4″ lip I left on the outside of it will stop the leg in the correct location every time. I am mounting these directly to the top so I took a Sharpie and marked three small locations then I flipped the top up, lining up the spacers to those marks, and used screws to attach them permanently to the top. I was a little worried about the legs being able to be kicked out from underneath the table, but I knocked it around a few times, and it wasn’t budging. When I want to use the bench I will lift it up from the wall, move the legs out, then set the top on the legs and then slide them against the lip that I left on the spacers. When I’m done with it I will lift the top slightly, move both of the legs in, then lower the top all the way down. 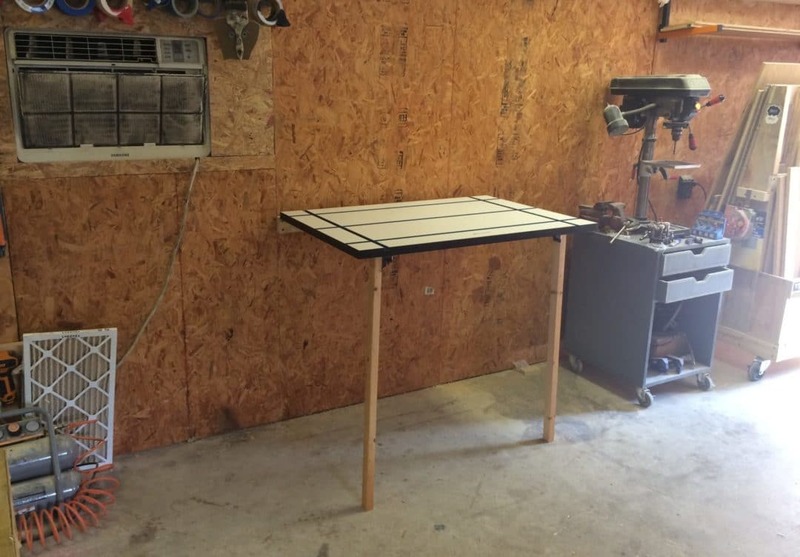 : ) Now I have this workbench that I will use to sit my shop fan on, then I have my other workbench that I’ll be able to use for all my T-track accessories. Keep in mind on this second workbench style, you can change up the dimensions very easily if you want a deeper or longer bench! Also, it would be a good fold out workbench for the home if you are needing a sewing desk or maybe a study area that can be folded away when not in use.